The possibility of flying nonstop from San Antonio to Reagan National Airport in Washington D.C. is making progress. An amendment to the federal Federal Aviation Authority reauthorization bill that would have helped establish a new route failed in the House in April. However, the city's representatives will make another attempt in the Senate. Creating new nonstop flights to the nation’s capital will take an Act of Congress because of the perimeter rule, which means non-stop flights to Reagan National can originate only from cities inside a 1,250-mile perimeter around Washington D.C. Reagan is one of the San Antonio’s most traveled to destinations without a non-stop flight. On Tuesday, the City Council’s Intergovernmental Relations Committee was updated about the city’s recent attempt and future efforts. San Antonio Congresssman Henry Cuellar and Will Hurd proposed an amendment that would allow airlines to switch existing Reagan National routes from cities inside the perimeter to cities outside of it if the airport is near a military base. “The whole point of the amendment was intended to benefit communities who are a long way from Washington but have military installations and need non-stop service into the nation’s capital,” said Jeff Coyle, San Antonio’s director of Government of Public Affairs. The amendment would have benefited San Antonio and San Diego. Currently, San Antonio does have non-stop flights to D.C.-area airports in Baltimore and Dulles, Virginia. The amendment was pulled by Cuellar after facing a lobby of strong opposition. It included letters from American Airlines, United Airlines, the International Association of Machinists and Aerospace Workers, and the Metropolitan Washington Airports Authority, which launched its own website opposing the measure. Southwest Airlines CEO Gary Kelly, however, penned a letter of support in favor of the amendment. Cuellar said they airlines were using scare tactics in statement sent shortly after the amendment was pulled. “These airlines falsely claimed that we were going to undermine retirees’ pensions, diminish passenger safety, threaten service in more than half the country, and many other things that were demonstrably false,” he said in the April 26 news release. District 8 Councilman Manny Pelaez expressed disappointment Tuesday at doing business with either airline. “When I found out that United Airlines and American Airlines spent millions of dollars to deploy an army of people to go lie to congress members, man, that’s really disappointing and it makes me regret every single ticket I’ve ever bought from United and from American Airlines,” Pelaez said. The city is not grounding its efforts, however. Coyle says there’s another chance for the amendment in the Senate. “We have two senators who are very engaged in the issue, and we’ll be working very closely with them in Washington to try to get this done — finally — for our community and our military bases,” he said. Reagan National is one of the top airports on the city’s priority list as it tries to secure additional non-stop destinations. Currently, passengers trying to reach Reagan must change planes or make a stop in other cities. San Antonio’s Aviation Director Russ Handy said about 190 passengers from San Antonio per day have Reagan National as their final destination. 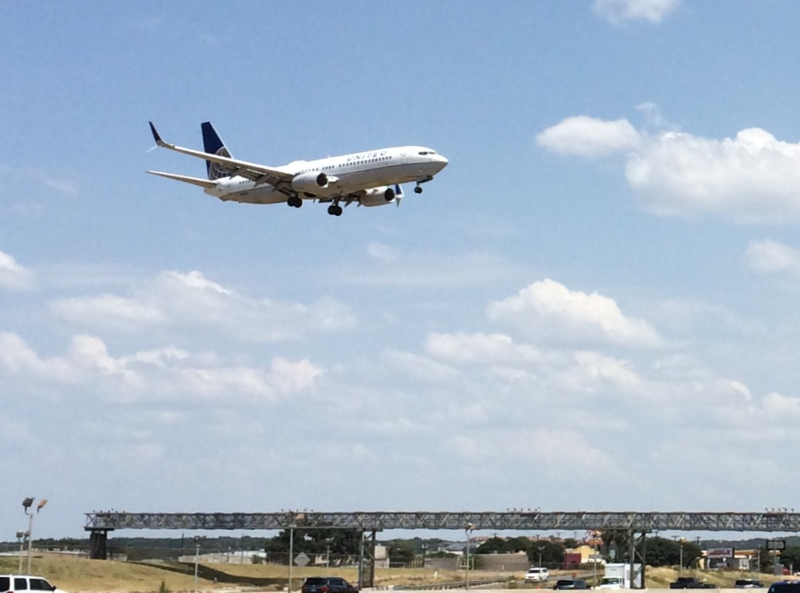 There are also about 190 passengers traveling from Reagan to San Antonio each day. The FAA reauthorization bill could be considered in the Senate in July. Former Congressman Henry Bonilla was hired as a lobbyist for the airport to help push the measure forward. He told the council committee Tuesday the push is far from over. “This like is the NBA playoffs in the first game: If you lose, that doesn’t mean anything. There’s a lot more ball to be played,” he said. The San Antonio International Airport is launching new non-stop flight service to Raleigh-Durham, North Carolina. It's the latest in a series of new routes established over the last two years. More People Are Flying Through San Antonio. How Can Airports Keep Up? The San Antonio International Airport saw a 5 percent increase in travelers over a one-year period – from 7.9 million to 8.3 million people – and recorded 17 straight months of passenger growth, as of November 2017.